David’s note: Now this is just getting ridiculous! I know certifications are more attainable than most people expect, but you guys just make them look dead simple! Congrats on your achievement Hamza and I hope many follow in your footsteps! I began following your blog in October 2014. I was working in the Financial Services industry and had only used Salesforce sparingly as an end-user. My daughter was born in December and that’s when I decided I needed to change careers and do something that would propel me forward. I kept thinking of your blog and decided to get into Salesforce. I didn’t know how to code, didn’t get a degree, and therefore the idea of getting professional qualifications was very appealing to me. I applied for a Salesforce job and got it in January 2015. That allowed me to work on Salesforce for 8 hours a day, but that wasn’t enough. I read Mayank’s story of certifications and thought, I can do that too. So, I booked my Admin exam and studied for it using the materials on your site. I passed! I had to continue. 3 weeks later, I had 4 certifications and was really happy with my achievements. But I wasn’t ready to tell my story yet. 6 months later, I got a job as a Salesforce Consultant for a Salesforce partner. I had also taken my Sales Cloud exam by then so I was 5x certified. I kept up to date with your blog and read all the success stories and was really happy to be amongst those (although I hadn’t shared my story yet). 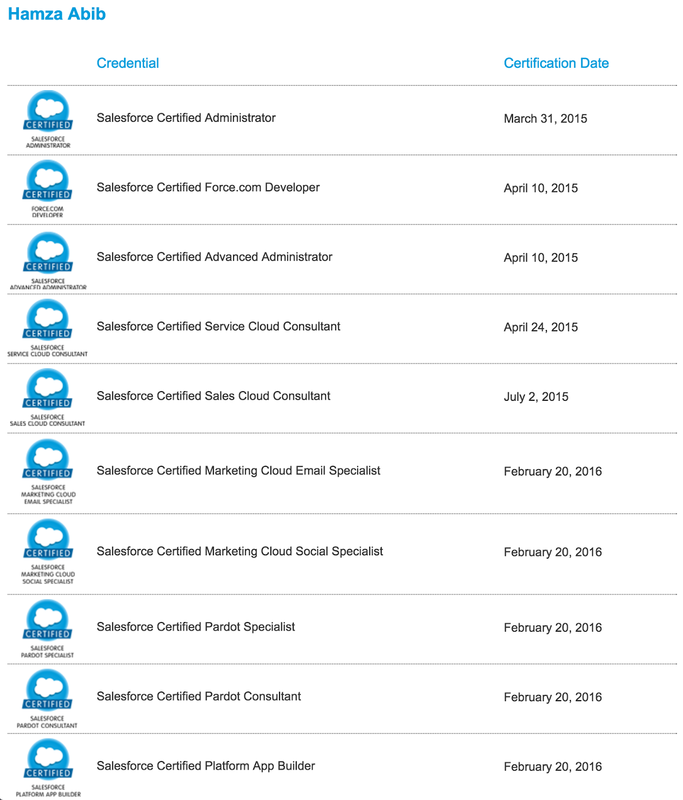 But my momentum was gone from the initial 4 certifications I had taken within 3 weeks. Reflecting on this in mid-February 2016, since it had been a year since I joined the Salesforce world, I felt that I should restart my momentum and continue my certification journey. So I decided to prepare for the next certifications. I sat down in a meeting room at work on Saturday 20th February and pulled out all the material I had put together to learn. I was determined to not leave that room until I had done at least 1 exam. 12 hours and 5 exams later, I went home. I had passed all 5 certifications on the same day and was now very happily 10x certified! It wouldn’t have happened if I hadn’t followed your blog back then in October 2014, so I would personally like to thank you for passing on the torch and showing so many of us that it is possible to get certified and progress if we put the time and effort in. I really started my journey a year ago, and now I’m a 10x certified Salesforce Consultant. Really couldn’t have done it without you and that’s why I wanted to share my story now. I plan on learning how to code (I will definitely go through your Apex Academy on Pluralsight) and going for my Platform Developer I and II exams, with the ultimate goal of becoming a Certified Technical Architect. I’m documenting my journey by blogging about it and helping more people by telling them how I got to where I am. Hopefully someone will learn from me in the same way that I’ve learnt from you. How is this even possible??? I am both inspired and impressed as I am about to embark on a similar journey, I had dared to imagine that I could get 3 sales force credentials within 6 months and thought that would be to big to achieve but clearly this is nothing compared to what Hamza has done. Now I have decided that there is nothing to fear or lose, I am going to follow and walk the path of the giants. Well done! Bidza – tell the world your success story soon too! GOOD LUCK AND GO GET THEM!! Good luck Bidza. If I can do it, so can you! Hamza congrats and great work. Thanks for sharing just to clarify you started reading about the exam same day you wrote the 5 exam? Maybe I am confused if that’s the case share some tips on how you did the review etc. Again this is Awesome. David your ARMY is getting bigger and bigger. I am looking for some shield that can help me learn how to code and hopefully plural sight is answer :). David you are a STAR. Varun – if Pluralsight is not the answer then I have failed as a teacher! Good luck! Yes, I prepared for and passed them all on the same day. However, I did make sure that I had all my study materials ready, and i’ve outlined what I’ve used on my blog (link is on David’s post above). It wasn’t easy, but glad I did it. Way to Go, Hamza! Very Impressive! Truly inspiring! I’m confident you’ll be coding in no time. Thanks Derhyk, I hope so. The Apex Academy is definitely a resource I will use in that journey. Hamza, you are a Hero! Truly inspiring especially since my story lines up with how you started out. Thank you for sharing and I wish you the best of luck! No hero at all, I just put in the effort and it paid off. It can do so for anyone else willing to take the plunge. Its really very inspiring story,Thanks for sharing and All the best for your future…. Thanks Sridhar, really appreciate the compliments. Good luck on your journey as well!